The zodiacal light over Montana in February 2019. View larger at EarthSky Community Photos. | Image via John Ashley. We just orbited past the halfway point between winter and spring solstices. We’ve reached the best time of year to look for the largest feature in our solar system visible to the naked eye — but a phenomenon that is almost never seen. After twilight fades into inky darkness, zodiacal light rises from the western horizon as a subtle cone of luminous light (white, no color) that’s slightly dimmer than winter’s faint Milky Way. You can’t see it with much moonlight or artificial light pollution. It originates as sunlight, faintly reflecting off countless dust particles that exist in the flat plane where Earth and all the other planets orbit our local star. While the Milky Way is bright star clusters veiled by dark dust lanes, the zodiacal light is local space dust that shimmers! 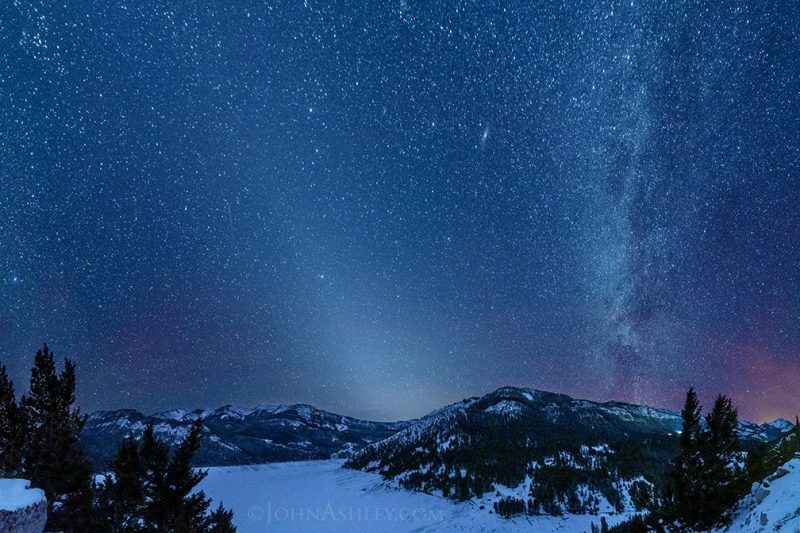 Bottom line: Photo of the zodiacal light over Montana in February 2019.